Want your team to perform at its best? 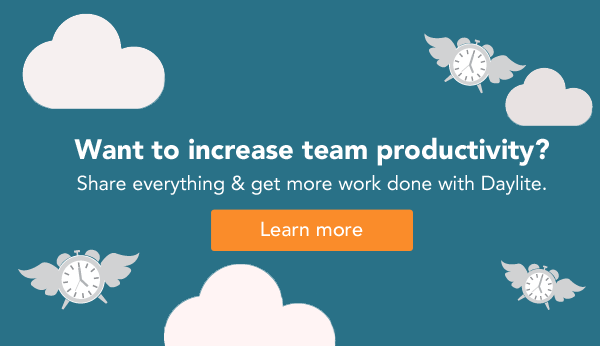 Start by avoiding the five common time-wasting things that ruin your team’s productivity. 40% of employee’s time is spent on unproductive things. 31 hours spent on unproductive meetings each month. 2 hours a day spent recovering from distractions. Average employee faced with 56 interruptions a day. It takes about 25 minutes to get back into the swing of things after an interruption. Nearly 20% of employee’s time is wasted searching and gathering internal information. A typical executive wastes 150 hours a year searching for lost information. Your team’s time is too valuable to be spent wasting looking for things or interrupting each other. Limit interruptions and increase productivity by giving your team access to all the information they need in a centralized location.